Fan Coils These are located inside your home and contain the evaporator coil and fan housing. Joined to the outdoor condensing unit by a copper line set, it blows air across the coil containing the cooled refrigerant into the duct work inside your home. Learn about the different fan coils by brand and type. Research the right model for your home and give us a call. We’ll confirm the correct model and SEER rating for your home during the in-home consultation. AC & HP Condensers Condensing units are located outside your home and contain the compressor and outdoor coil for your air conditioning and heat pump units. Along with an outdoor fan, this unit helps to disperse the heat generated from the refrigerant cycle and allow the “cooled” refrigerant to return to the home again. The compressor is the heart of the system and helps pump the refrigerant throughout the system. Heat Pumps Using electricity, heat pumps move heat from a cool space to a warm space. The cool space gets cooler and the warm space gets warmer. Where you live will determine what kind of heat pump is best for your home. 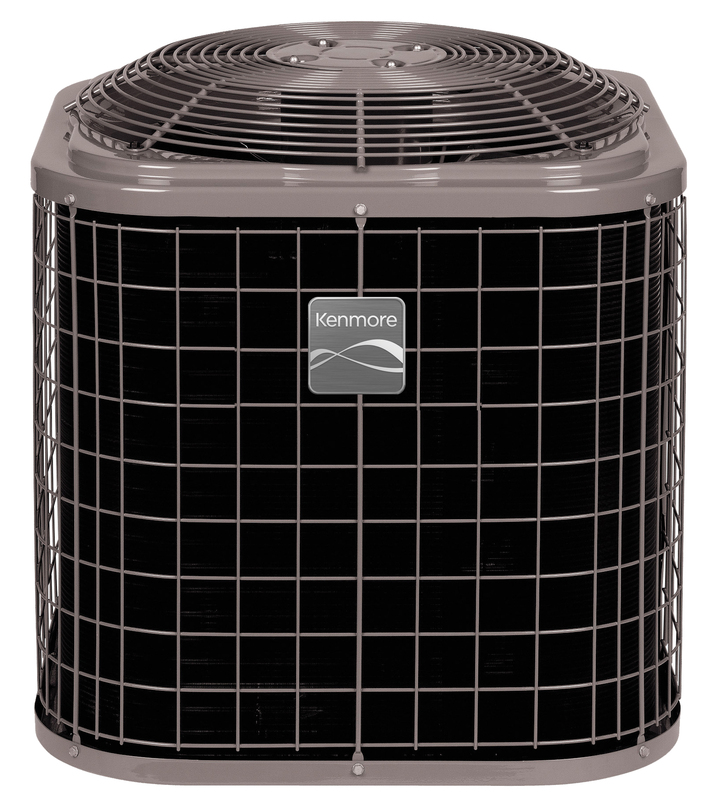 Sears offers a variety of Heat Pumps from both Carrier® and Kenmore® brands. Central Air Systems Located outside your home, a centralized air conditioning unit cools and dehumidifies the air before it circulates inside the house. The unit is connected to duct work that runs throughout your home. Blowers drive cold air out of the ducts to cool down rooms and vents outside to rid the home of excess heat and moisture. Installing a cooling system is great way to make your home more energy efficient. However, an improperly sized unit will cost you more in the long run. Moreover, some local or state governments may offer tax incentives for more efficient models. A certified Sears technician will be happy to help you find the best and most efficient unit for your home. Make an appointment today!